Miss Chrissy is Melbourne Darling’s Muse of the Month not only because she is a refreshingly fine example of embodying grace and lady-like charm in today’s modern world, but because of her inspiring passion for empowering girls of all ages to enhance their own, natural outer & inner beauty through the best of vintage styling, etiquette and manners. Why do you think there is suddenly such a cherished appreciation for all things vintage? Not only do the eras between the 1920’s to the 1960’s epitomise the glamour, style & the razzle dazzle we all crave in our lives, but these eras represent times of strength, stoicism, innovation, rebellion, fun and edgy designs in hair, makeup, clothing, ideals and lifestyle. Instead of looking to be just ‘on trend’ many individuals now look to be individual, different and cutting edge and vintage styling ticks all those boxes as most vintage is individual. However, I do think the media recycles it into the mainstream every few years but this gains exposure for the next generation who may otherwise not always get on board. In this case, I think it is a good thing that every few years a Hollywood Starlet walks the red carpet in a Vintage Gown with Old World (as they call it) hair and makeup and just like that, Vintage styling is popular and in demand once again. Lastly, the increase in education and interest surrounding the concern to save our environment leads individuals to more likely take on the old-fashioned ‘make do and mend’ mentality. As a result, the re-use, re-cycle and up-cycle trends become more popular and mainstream. ‘I think I was born in the wrong era!’ I have heard this statement a lot and I also wonder whether this is something you hear often from ladies who take part in your classes? I do hear that a lot from ladies. I believe that some of us are just ‘old souls’ and this is why we gravitate to an old world. Most people who attend the classes feel they develop a sense of belonging when they are surrounded by vintage styled & vintage loving women who share the same enjoyment in defining, finding or just embracing their own individual vintage style and it’s lovely to watch their confidence blossom. I had a young girl of just 13 years of age attend a workshop last week. She was not interested in iPhones, iPads or iPods as there was no ‘I’ in ‘us’ and it was the group aspect of ‘us’ that she was enjoying – so cool. She loved being surrounded by a group of women of all ages, excited to learn all the hair and makeup techniques from the 40’s and 50’s. All the women in the room embraced and relished in the brush up of manners, etiquette & good posture and their feedback was that they all admired it and they all wanted to see more of it in the today’s modern world. To all the old souls and vintage inspired women out there living in the modern world of today, what is your most important piece of advice? Make the effort each and every day to spend a few moments on yourself, with yourself and for yourself. Also, don’t be so body conscious. If you look and feel uncomfortable then find another style and don’t try too hard at something that doesn’t come easy to you. Find a look that suits you, your body, your hair, your skin and your lifestyle. Watch some old films and search fashion archives on the internet for some inspiration. You will be amazed with what you find! Even if you cannot find true vintage originals, I believe anyone can still find a vintage inspired look that suits you. You can be subtle about it, by selecting one piece to be the feature of your outfit i.e. a gorgeous blouse from the 40s, a statement hat from the 20s, a swanky pair of gloves, even a jewel encrusted brooch. On the other hand if you are confident enough to go head to toe, I think it is most important to pay attention to the detail! How did The Lindy Charm School for Girls come about? I have been involved in the world of vintage styling and dancing for the past twenty years and The Lindy Charm School for Girls was a natural progression from teaching my own dance students how to re-create and style themselves based on the swing era, which was the music they were predominately dancing to. These home based “styling days” became so popular that I decided to take it on the road and share the knowledge around Australian, New Zealand and more recently in the US. Most people seeking out a vintage lifestyle usually have a bit of an old soul to start with and have a penchant for the history of old. I grew up with the music and films of the 40’s and 50’s with my dad. My favourite memory growing up was Saturday afternoon movie time with him, always with a black and white Jerry & Dean or an Elvis flick on. My eye for vintage fashion and style started then, but it was when I was introduced to the dance (“Lindy Hop”) that my passion for swing music grew, and then my further interest in the fashion and lifestyle of the 30’s and 40’s. I remember when I got my first 1940’s original crepe, A-line frock, embellished with beautiful beading. I was in heaven and I matched it with the right hat, accessories, hair and makeup. When I walked into my parents’ home, my dad teared up (and being a soldier, that NEVER happened), he said he thought his mother had walked home. What has been the most rewarding aspect of running The Lindy Charm School for Girls so far? The feedback I receive in the letters, emails and calls saying how The Lindy Charm School has changed one’s life, saved one’s live or rebuilt a person’s confidence. It’s comments like these that are very humbling and make us also believe even more in what we are doing and The Lindy Charm School is something that I am so blessed to be at the helm of. Where are your favourite places to visit in Melbourne? The Vintage Garage is one of my most favourite places. Mainly because I get to hang out there often when we are doing our Pin Up/Vintage Makeover photoshoots with the amazing Brooke Orchard Photography and also because the gals Marissa and Lisa are so helpful and quirky and fun! They also stock HEAPS of cool stuff like Bonnie Rose Vintage clothing and Fossil Vintage clothing. Both collectors have amazing vintage finds. The Circa Vintage Clothing is a store that stocks vintage clothing that is always of the utmost quality. Owner, Miss Nicole Jenkins is well known for being the pre-eminent authority on all things to do with vintage clothing and because of her knowledge, you don’t just buy the outfit but you learn the history behind it as well. My favourite restaurant is Longrain on Little Bourke St. Because I had to wait until 10pm for a sitting to dine there and it was totally worth it and I have never tasted Thai food as amazing since! I have many favourite cocktail bars in Melbourne, but I have to say I’ve had the best times with our darling friends at The LuWow and Madame Brussels. My favourite place to stay and indulge in afternoon tea is at the Hotel Windsor. My team and I presented an ‘Afternoon Tea with a Sip of Manners‘ to 150 patrons two days in a row a while back and the place left such an impression on me with its glorious surrounds. Chrissy has done a fantastic job at guiding women of all ages to rediscover the old-school glamour and style of the early 20th century. You can meet the charming Chrissy at the Love Vintage Show in Melbourne next year or attend one of her workshops. 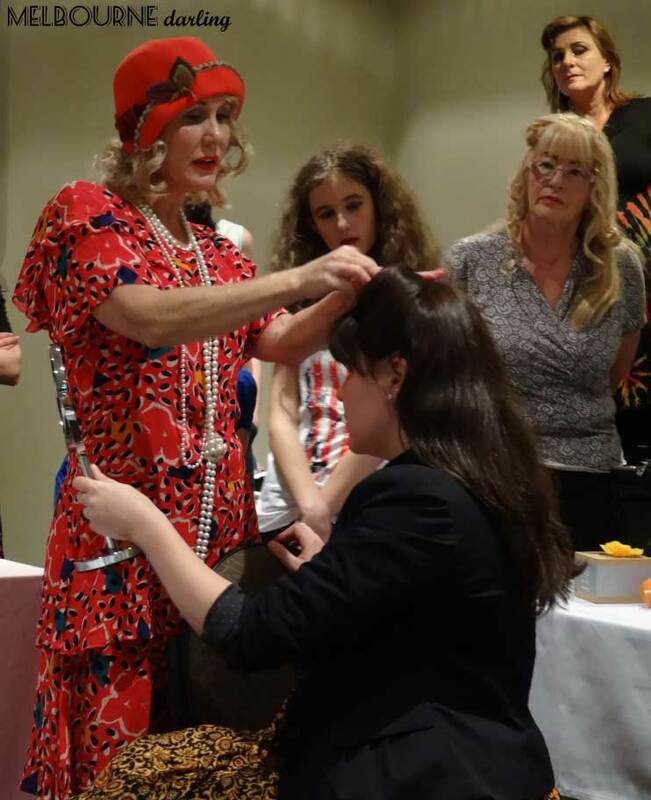 Keep your eyes peeled for my review on the workshop Chrissy held in Melbourne recently so you can be ready to book yourself into the next Lindy Charm School for Girls Workshop in 2014 and experience the magic of vintage styling for yourself! Men, don’t feel left out! Look out for the Suave School For Gents, an upcoming feature of The Lindy Charm School, featuring fashion, manners and grooming guidance and advice. This is currently an online feature, with hopes of it becoming a workshop in the future so stay tuned!